Anybody who knows me will attest to the fact that I am long-time Star Wars fan. It’s not just the films either – I’ve read a lot of the “extended universe” books, collected the trading cards, have a loft full of action figures (both classic and new) and much, much more. In short, I’m a Star Wars nerd. I’ve also managed to pass this love onto my children, as both of them are showing signs of Star Wars geekiness even at this young age. Christmas 2017 sees the release of two new Star Wars toys, both of which I was sent to test out and write about on here. 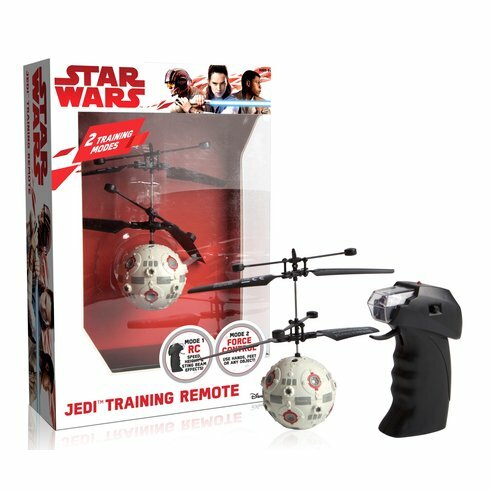 The first is the Jedi Training Remote. Anyone who has seen the original Star Wars trilogy should recognise this instantly – it’s modelled on the ‘remote’ that Luke uses to do lightsaber training with aboard the Milenium Falcon. Whilst this neat little replica doesn’t have onboard AI to fly freely around your living room, zapping you freely (probably for the best, eh?!) it DOES come with some handy features. As a mini-drone, you can use the little remote control to fly it around your room yourself – but even cleverer, the inbuilt sensors allow you to control it with “the Force” (aka your hands!). We’ve tried it a few times now – you can see one of our flights in the video below – and whilst I’ve definitely not fully mastered the Force control yet, I was impressed none the less. Especially when you consider it retails for around £29.99. My kids certainly enjoyed playing with it! The second product is called a “Holopane”, and is basically a very clever optical illusion in a box. When I was little, we used to go to the Science Exploratory in Bristol, and one of the most memorable exhibits for me was the optical illusion where an inverted image is made to look like it’s coming outward and towards you. I realise I’m probably explaining that badly, but I’m sure you’ve probably seen similar. Well, the Holopane is a miniature version of this, and comes in a number of different character varieties. 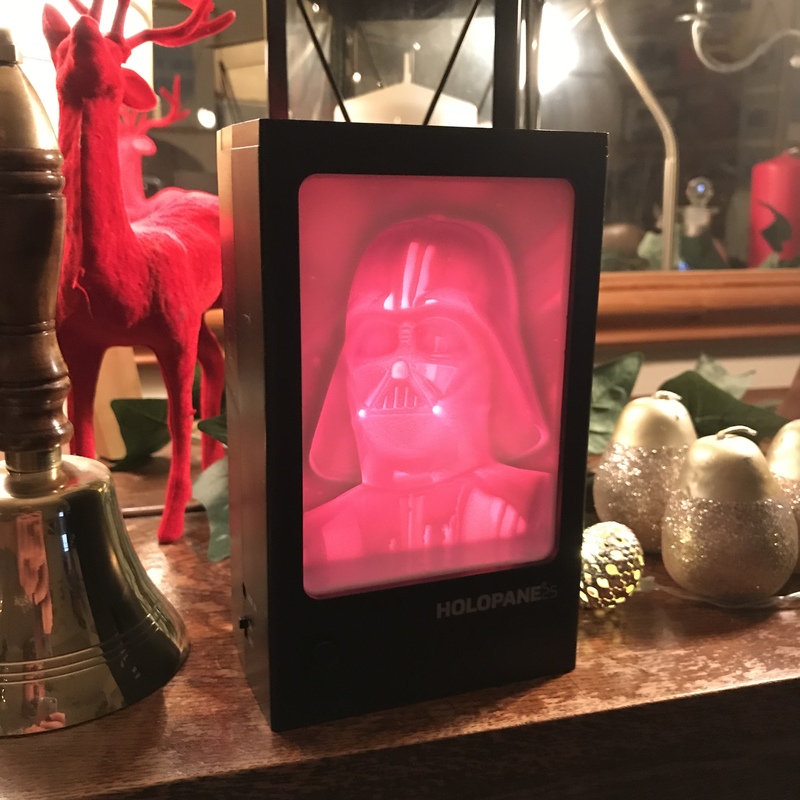 Each box contains a Holopane (mine was Darth Vader) and a back-light, along with some coloured slides you can use to make the light several different colours. 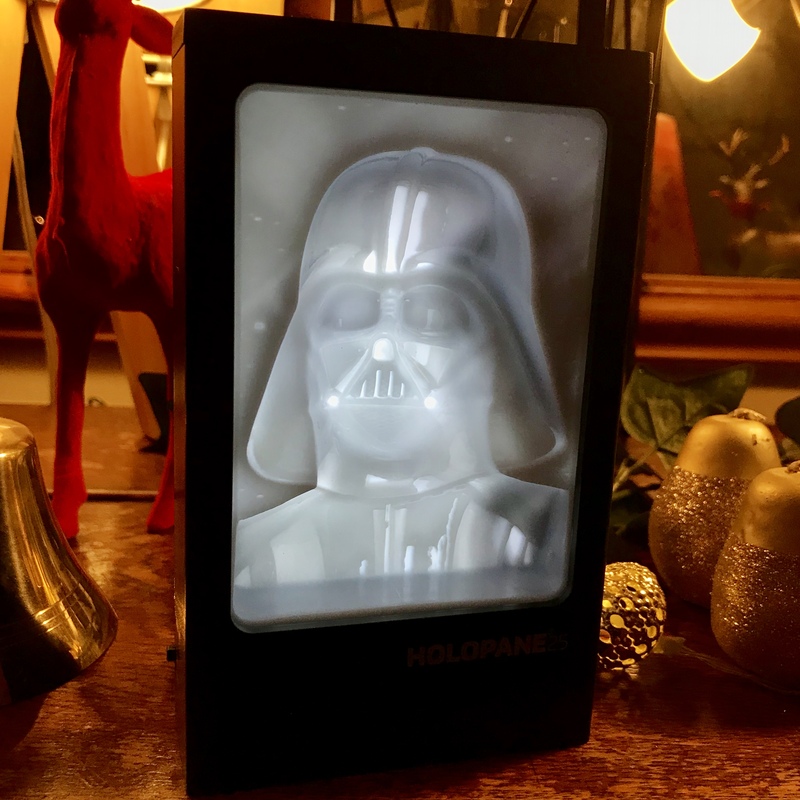 When you switch on the backlight, the holopane lights up in such a way that it looks like it’s jumping out of the box at you. Weirdly, when you move your head from side to side, the image even seems to follow you around the room! Creepy – but very clever! 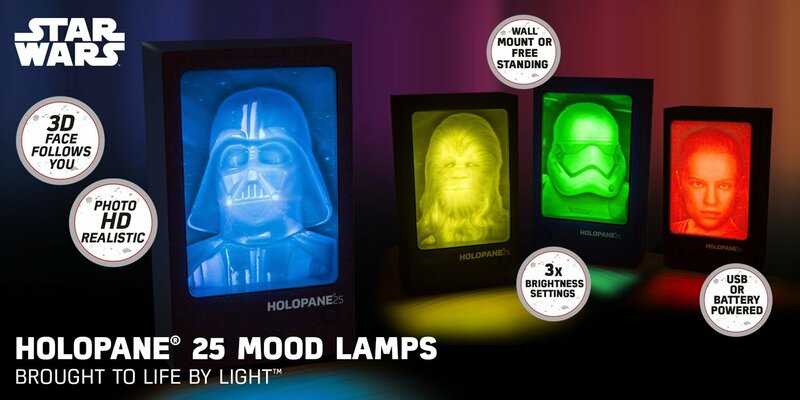 The Holopanes are a little bit cheaper than the Jedi Training Remote, and they’d definitely make a nice little present. Each one comes with batteries, but you also get USB cable to plug it in to your PC or charger – meaning it probably makes a nice little desktop novelty. So while you’re waiting patiently for The Last Jedi to finally come out, why not take a look at the newest Star Wars toys on offer now?